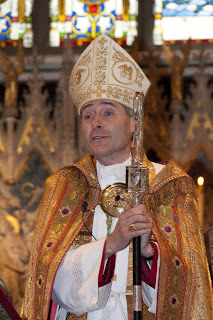 Today The Right Reverend Mark Davies was installed as the Eleventh Bishop of Shrewsbury, in succession to The Right Reverend Brian Noble. 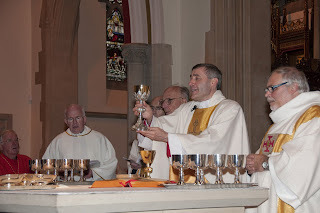 Bishop Mark was installed at the beginning of Mass celebrated to mark the Retirement of Bishop Brian and the beginning of Bishop Mark's ministry as Shepherd of the Diocese of Shrewsbury. The Mass was celebrated here in The Cathedral and was attended by representatives from across the diocese and by main of the clergy of the Diocese and some from Bishop mark's former Diocese of Salford. 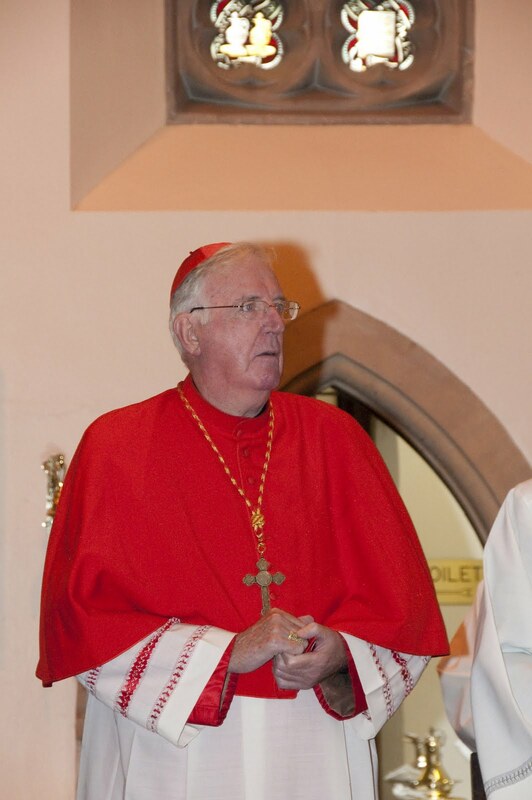 Many of the Bishops of England and Wales were also present, including His Emminence Cormac Cardinal Murphy O'Connor. Today, Bishop Brian was with us here at The Cathedral, his Parish Church, to celebrate his Golden Jubilee of priestly ministry. 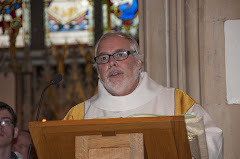 Bishop Brian presided at the 10.45am Mass in The Cathedral. Many of the children from The Cathedral Primary School were present, and the school choir sang a special song for the Bishop after Communion. Towards the end of Mass Bishop Brian was invited to sit down whilst a number of presentations took place, firstly a gift from the three parishes of the Shrewsbury town and then one by the primary school. Following the presentations The Cathedral Choir sang Ad Multos Annos to Bishop Brian, a traditional Latin toast meaning may he live for many more years! After Mass, the celebrations continued in a marquee in the grounds of The Cathedral. Food and drink was enjoyed by many before Bishop Brian cut his anniversary cake! Music at the reception was provided by the fabulous Saint Winefride's Convent School orchestra. 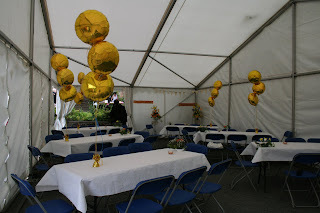 Many thanks to all those who helped make the day so special. 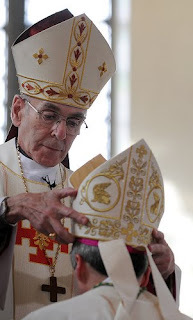 Ad multos annos to The Bishop! I have just returned from pilgrimage to Lourdes with the Family of Flame. A fabulous pilgrimage, and now back to The Cathedral to continue the celebrations of Easter! The Lord is truly risen alleluia, alleluia! We have waited for almost two years to have the case installed for The Cathedral Book of Remembrance, and finally this week it happened! The glass arrived, the metal bits stacked up, the lights installed and finally the Book has a place of dignity and respect fitting for those whose lives it recalls. 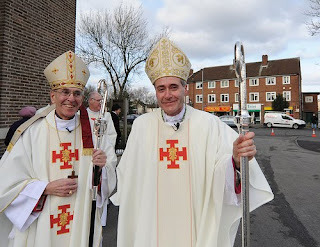 On Sunday 28th of February Bishop Mark visited The Cathedral for the first time since his ordination. 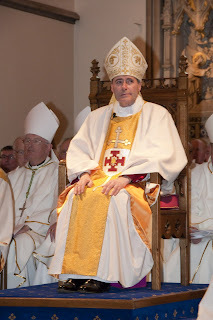 Bishop Mark presided at the 10.45am Mass in The Cathedral. The celebrations continued in The Chapter House afterwards were a fabulous selection of cakes and fizz was served up to welcome Bishop Mark. 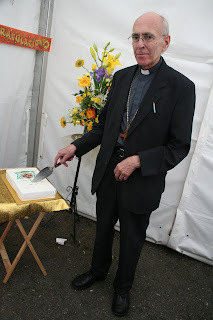 The centre piece was a cake iced with a picture of Bishop Mark on his ordination day! 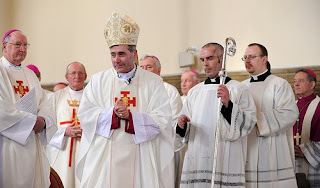 Yesterday at Saint Anthony's in Wythenshaw, Monsignor Mark Davies was ordained as the Coadjutor Bishop of Shrewsbury. 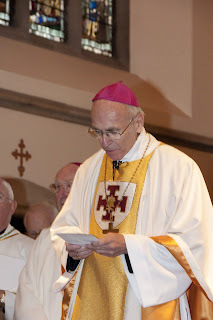 He will work along side Bishop Brian as his assistant until Bishop Brian retires, at which point Bishop Mark will automatically become our Ordinary, our Diocesan Bishop. We offer him our warmest congratulations. With thanks to Mazur/catholicchurch.org.uk for the photographs more can be seen at www.flickr.com/photos/catholicism/ and the texts of Archbishop Bernard Longley's homily can be found on the Diocesan Website. This afternoon over three hundred and fifty people gathered from across the diocese here at The Cathedral. Why? To meet with Bishop Brian. Many of those gathered will be received into full communion with the Church this coming Easter and the Rite of Election is one of the important stages on that journey. It was fabulous to see the Cathedral so full. Please continue to pray for all those journeying this lent towards full communion and membership of the Church. Next Monday, the Feast of the Chair of Peter, Monsignor Mark Davies is being ordained as Coadjutor Bishop of Shrewsbury. Preparations are now in their very final stages, including the cleaning and polishing of some of the sacred vessels. We pray for Bishop Elect Mark as he begins his Episcopal Ministry in our diocese, may he be for us a faithful shepherd. Our thoughts and prayers are with all those affected by yesterdays explosion. Prayers where offered at Sung Vespers yesterday evening, at Mass last night and will continue to be offered at The Cathedral for all those involved, those injured, their families and friends, and the emergency services. 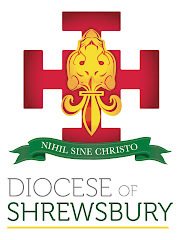 is dedicated to Our Lady Help of Christians and Saint Peter of Alcantara and is the mother church of the Roman Catholic Diocese of Shrewsbury.